Type V phosphodiesterase (PDE V) metabolizes cyclic guanosine monophosphate (cGMP) and is abundant in the kidney and vasculature and was found recently in the heart. Sildenafil is a PDE V inhibitor that is used clinically for erectile dysfunction. Brain natriuretic peptide (BNP) is a cardiac peptide with vasodilating, lusitropic, and natriuretic properties that are mediated via cGMP. It was hypothesized that chronic inhibition of PDE V (PDE VI) will enhance the renal actions of exogenous BNP by potentiating the renal cGMP. The cardiorenal and humoral function was determined at baseline in two groups of dogs with pacing-induced overt chronic heart failure (CHF; 240 bpm for 10 d): Group 1 (n = 6) received Sildenafil 50 mg orally three times daily during the 10 d of pacing, and group 2 (n = 5) received no PDE V inhibitor. The response to acute subcutaneous BNP (5 μg/kg) administration also was compared in both groups on day 11. The GFR was assessed by inulin clearance (P < 0.05). There was no improvement of renal function in group 1 after 10 d of PDE VI as compared with group 2, despite having higher cardiac output (P < 0.05). Group 1 had significantly higher plasma (44 ± 2 versus 21 ± 3 pmol/ml; P < 0.05) and urinary cGMP (4219 ± 900 versus 1954 ± 300 pmol/min; P < 0.05) as compared with group 2. With acute subcutaneous BNP administration, group 1 had a natriuretic and diuretic response that was associated with an increase in GFR (30 ± 6 to 45 ± 6 ml/min; P < 0.05) and that was not observed in group 2 (25 ± 6 to 29 ± 4 ml/min). Plasma BNP increased to a similar extent in both groups with subcutaneous BNP. In contrast, group 1 had a much greater urinary cGMP excretion (4219 ± 900 to 8600 ± 1600 pmol/min; P < 0.05) as compared with group 2 (1954 ± 300 to 3580 ± 351 pmol/min; P < 0.05). In experimental overt CHF, chronic administration of PDE V inhibitor did not enhance renal function despite an improvement in cardiac output. However, chronic PDE VI significantly enhanced the renal hemodynamic and excretory responses to exogenous BNP. This study supports a role for PDE V as contributing to renal maladaptation in a model of experimental overt CHF and the strategy of maximizing the renal cGMP system by combined PDE VI and natriuretic peptides in CHF to improve renal function. Cyclic 3′-5′-guanosine monophosphate (cGMP) is the second messenger of both the natriuretic peptide (NP) system and the nitric oxide (NO) system (1). Both of these humoral systems play important roles in the preservation of myocardial, vascular, and renal function in acute and chronic heart failure (CHF) (1–4). Recent evidence suggests that both the NP/cGMP and NO/cGMP signaling pathways are impaired in overt CHF and that such impairment may contribute to the progression of cardiorenal dysfunction in CHF (2,5). With regard to the kidney, we previously reported, as have others, that the glomerular, natriuretic, and urinary cGMP excretory responses to both atrial natriuretic peptide and brain NP (BNP) are attenuated in overt experimental and human CHF (6,7). In addition, Nesiritide, the recombinant human BNP (Scios, Inc., Fremont, CA) that is approved for the management of acute decompensated CHF, in some clinical studies failed to demonstrate a renal-enhancing property (8,9). The exact mechanisms that mediate the attenuated response to NP in overt CHF remain poorly defined and most likely are multifactorial. These mechanisms may include increased degradation of the peptides, decreased number or reduced affinity of biologic receptors or postreceptor events that lead to reduced production of cGMP, or increased cGMP degradation (2,10). Elucidation of therapeutic strategies to restore the renal responsiveness to exogenous NP would be an advance in the therapy of advanced CHF. Type V phosphodiesterase (PDE V) metabolizes cGMP and is abundant in the kidney and vasculature and was reported recently in the heart (11,12). The exact role of PDE V in the kidney in CHF remains poorly defined, particularly in overt CHF. In contrast, in renal disease states such as nephrotic syndrome, it has been shown that PDE V contributes to renal impairment and reduced sensitivity to NP (13). Sildenafil is a PDE V inhibitor that is used clinically for erectile dysfunction and is undergoing evaluation for the management of pulmonary hypertension (14,15). Despite the importance of PDE V in the regulation of renal function, especially as a modulator of the NP and NO systems at the level of the glomerulus, the effects of chronic PDE V inhibition (PDE VI) in CHF on renal function has not been well defined. Although myocardial function has been reported to improve with chronic PDE VI in a model of experimental ventricular dysfunction (12), like other potent neurohumoral modulators, such as endothelin receptor antagonists, this may be associated with systemic vasodilation that may fail to enhance renal function in CHF despite improvements in myocardial function (16). Therefore, it remains a high priority to define the effects of chronic PDE VI on the kidney in CHF. Furthermore, the concept of maximizing the renal NP/cGMP system with PDE VI combined with exogenous BNP administration represents a novel approach in CHF that warrants further investigation. Our study therefore was designed to address two objectives. First, we defined in a canine model of overt CHF the renal response to PDE VI with Sildenafil during 10 d of experimental CHF. This model closely mimics the renal adaptations of chronic overt CHF with impaired renal hemodynamics and avid sodium retention (16). Second, we evaluated the renal responses to exogenous BNP in the presence of chronic PDE VI in overt experimental CHF. 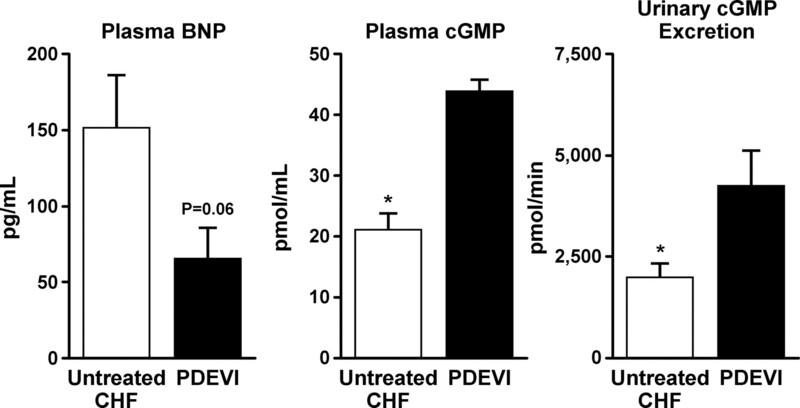 We hypothesized that chronic PDE VI will enhance the renal actions of exogenous BNP and thus represent a novel strategy to maximize the NP/cGMP system in this syndrome of impaired cardiorenal function. Studies were conducted in two groups of male mongrel dogs (18 to 23 kg) with overt CHF that was produced by rapid ventricular pacing at 240 bpm for 10 d on a fixed sodium diet. Group 1 (n = 6) received Sildenafil 50 mg orally three times daily (Pfizer, Inc., New York, NY) during the 10 d of pacing and one dose 1 h before the administration of canine BNP (5 μg/kg; Phoenix Pharmaceuticals, Inc., Belmont, CA) subcutaneously on day 11. Group 2 (n = 6) received no PDE V inhibitor but did receive subcutaneous canine BNP (5 μg/kg) alone on day 11 of CHF. The dosage of subcutaneous BNP used, 5 μg/kg, was based on our previous study that reported the renal actions of chronic subcutaneous BNP in experimental CHF (17). Studies were performed in accordance with the Animal Welfare Act and with approval of the Mayo Clinic Institutional Animal Care and Use Committee. All dogs underwent implantation of a programmable cardiac pacemaker (Medtronic, Minneapolis, MN). Under pentobarbital sodium anesthesia (30 mg/kg intravenously) and artificial ventilation (Harvard respirator; Harvard Apparatus, Millis, MA) with 5 L/min supplemental oxygen, left lateral thoracotomy and pericardiotomy were performed. With the heart exposed, a screw-in epicardial pacemaker lead was implanted into the right ventricle. The pacemaker generator was implanted subcutaneously into the left chest wall and connected to the pacemaker lead. Dogs received pre- and postoperative prophylactic antibiotic treatment with 225 mg of clindamycin subcutaneously and 400,000 U of procaine penicillin G plus 500 mg of dihydrostreptomycin intramuscularly (Combiotic; Pfizer, Inc.). Postoperative prophylactic antibiotic was continued through the first two postoperative days. Dogs were fed a fixed sodium diet (58 mEq/d; Hill’s ID, Hill’s Pet Nutrition, Topeka, KS) and allowed water ad libitum. All dogs were walked daily. Appetite, activity, body temperature, and condition of surgical skin sites were documented. After a 14-d postoperative recovery period, the pacemaker was turned on at 240 bpm. Group 1 (n = 6) received Sildenafil 50 mg orally three times daily during the 10 d of pacing, and group 2 (n = 5) received no PDE V inhibitor. On day 11 of rapid ventricular pacing at 240 bpm, an acute experiment was performed to determine the cardiorenal and humoral function in both groups and also the response to acute subcutaneous BNP administration (5 μg/kg). On the night before experimentation, animals were fasted and given 300 mg of lithium (Li) carbonate for assessment of renal tubular function. On the morning of the experiment, only group 1 received a final dose of Sildenafil 50 mg 1 h before the dogs were anesthetized with sodium pentobarbital (15 mg/kg intravenously), intubated, and mechanically ventilated with supplemental oxygen (Harvard respirator) at 20 cycles per minute. A flow-directed balloon-tipped thermodilution catheter (Ohmeda; Criticath, Madison, WI) was advanced into the pulmonary artery via the external jugular vein for cardiac hemodynamic measurement. The femoral artery was cannulated for BP monitoring and blood sampling. The femoral vein also was cannulated for inulin and normal saline infusion. The left kidney was exposed via a flank incision, and the ureter was cannulated for urine collection. A calibrated electromagnetic flow probe was placed around the renal artery to measure renal blood flow (RBF). All of the dogs continued to be paced at 240 bpm during the acute experiment. The experiment began after a 60-min equilibration period, with a 30-min baseline urinary clearance. After the 30-min baseline urinary clearance, subcutaneous canine BNP 5 μg/kg was administered in the right hind leg. After a 15-min lead-in period, a 60-min urinary clearance period was performed. Cardiovascular parameters that were measured during the acute experiment included mean arterial BP (MAP), right atrial pressure, mean pulmonary arterial pressure, cardiac output (CO), and pulmonary capillary wedge pressure. CO was determined by thermodilution in triplicate and averaged (Cardiac Output model 9510-A computer; American Edwards Laboratories, Irvine, CA). MAP was assessed via direct measurement from the femoral arterial catheter. Inulin was administered intravenously at the start of the equilibration period as a calculated bolus, followed by a 1-ml/min continuous infusion to achieve plasma levels of 40 to 60 mg/dl. GFR was measured by inulin clearance. Cardiovascular hemodynamics were measured at the start of each urinary clearance. Arterial blood was collected in heparin and EDTA tubes and immediately placed on ice midway through each clearance. After centrifugation at 2500 rpm at 4°C, plasma was decanted and stored at −20°C until analysis. Urine was collected on ice during the entire period of each clearance for assessment of urine volume, electrolytes, and inulin. Urine that was collected for cGMP analysis was heated to >90°C before storage. Plasma samples for BNP, renin, and angiotensin II (AngII) were measured by RIA using the method as described previously (17). Plasma and urinary samples for cGMP were measured by RIA using the method of Steiner et al. (18). Urinary and plasma inulin concentrations were measured by the anthrone method (19). Urinary and plasma Li levels were determined by flame emission spectrophotometry (model 357; Instrumentation Laboratory, Wilmington, MA). Using the Li clearance (CLLi) technique, proximal tubular fractional reabsorption of sodium (PFRNa) was calculated using the equation PFRNa = [1 − (CLLi/GFR)] × 100, where CLLi = (urine Li × urine flow)/plasma Li. Results are expressed as mean ± SEM. Comparisons within the group were made by paired t test, and comparisons between groups were made by unpaired t test. GraphPad Prism software (GraphPad, Inc., San Diego, CA) was used for the above calculation. Statistical significance was accepted as P < 0.05. 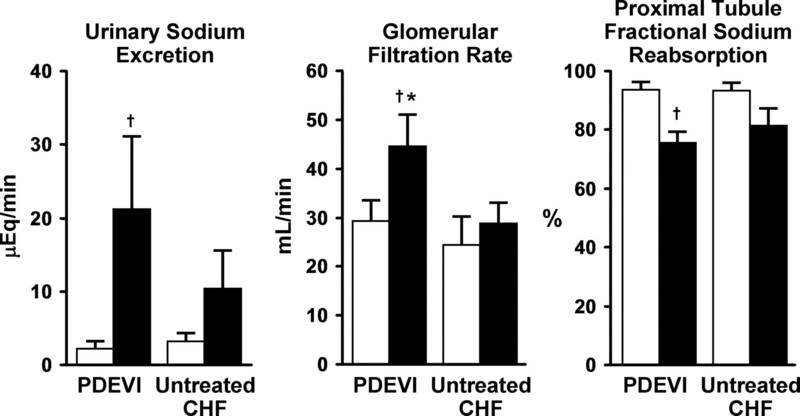 Table 1 reports the cardiorenal function response to PDE VI in our model of experimental CHF with Sildenafil administered at a dosage that was based on preliminary studies and confirmed previous reports of an enhancement of cardiovascular hemodynamics. CO was higher in the PDE VI group, whereas MAP and cardiac filling pressures were similar between the two groups (Table 1). Systemic vascular resistance was lower in the PDE VI group compared with the untreated group. Despite an enhanced CO with PDE VI, urinary sodium excretion (UNaV), urine flow (UV), GFR, and RBF were not improved with Sildenafil and thus were similar between the two groups. There was a strong trend for plasma BNP to be lower in the PDE VI–treated group as compared with the untreated CHF group (Figure 1). Both plasma cGMP and urinary cGMP excretion were significantly higher in the PDE VI–treated group as compared with the untreated CHF group (Figure 1). Plasma AngII trended to be higher in the PDE VI group (165 ± 50 versus 72 ± 17 pg/ml; P = 0.1) as compared with the untreated CHF group, whereas plasma renin was similar between the two groups. Plasma brain natriuretic peptide (BNP), plasma cyclic guanosine monophosphate (cGMP) and urinary cGMP excretion in the untreated congestive heart failure (CHF; □) and type V phosphodiesterase (PDE VI; ▪) groups. *P < 0.05 untreated CHF versus PDE VI. As reported in Table 2, in both the PDE VI–treated and untreated CHF groups, pulmonary capillary wedge pressure, right atrial pressure, and pulmonary arterial pressure decreased with subcutaneous BNP administration. MAP was significantly reduced in the PDE VI–treated group, whereas it remained unchanged in the untreated CHF group. CO was unchanged in both groups with subcutaneous BNP. Figure 2 and Table 2 report GFR, UNaV, and PFRNa and other key parameters of renal function. In the PDE VI–treated group, subcutaneous BNP resulted in an increase in GFR that was not observed in the untreated CHF group. UNaV was increased and PFRNa decreased significantly with subcutaneous BNP in the PDE VI–treated group, whereas it only trended to change in the untreated CHF group. There was a trend for a greater increase in UV in the PDE VI group as compared with the untreated CHF group. RBF increased in both groups with acute BNP administration. GFR, urinary sodium excretion, and proximal tubule fractional sodium reabsorption at baseline (□) and after subcutaneous BNP (▪) in the untreated CHF and PDE VI groups. *P < 0.05 PDE VI versus untreated CHF; †P < 0.05 versus baseline. Table 2 reports the neurohumoral responses in the two groups in response to acute subcutaneous BNP. With the administration of subcutaneous BNP, plasma BNP levels increased similarly in both groups. However, urinary cGMP excretion was significantly higher in the PDE VI–treated group as compared with the untreated CHF group (Table 2). Both plasma AngII and renin decreased significantly with subcutaneous BNP in the PDE VI–treated group but was unchanged in the untreated CHF group (Table 2). The objectives of our study were first to define the cardiorenal and humoral actions of 10 d of chronic PDE VI in a large animal model of dilated cardiomyopathy that closely mimics the cardiorenal and neurohumoral functions of human CHF with avid sodium retention, impaired GFR, and renal resistance to the NP (16). The second objective was to determine whether chronic PDE VI enhances the renal hemodynamic and tubular actions of acute exogenous BNP in experimental overt CHF. In this model of overt CHF, 10 d of PDE VI treatment did not improve renal function despite an improvement of CO but with a trend for greater activation of AngII. However, PDE VI enhanced the renal actions of acute exogenous BNP, resulting in an increase in GFR and UNaV, whereas in the untreated CHF group, exogenous BNP administration did not result in improvement of renal function. These findings provide new insights into the role of PDE V in cardiorenal regulation in CHF with important therapeutic implications. GFR, RBF, UNaV, and UV were similar between the PDE VI–treated and untreated CHF groups. These findings were surprising in view of improved CO in the PDE VI–treated group. Previous studies demonstrated a compensatory role for the endogenous NP to maintain renal hemodynamic and excretory function in CHF (20). In the PDE VI group, however, there was a strong trend for plasma BNP to be lower as compared with the untreated CHF group. This decrease in endogenous BNP may have contributed to the lack of improvement in renal function with PDE VI. Furthermore, in the chronic PDE VI group, there was a trend for plasma AngII to be higher, possibly related to the greater systemic vasodilation with PDE VI, which also may have contributed to the lack of improvement in renal function with chronic PDE VI. It also is possible that the trend for a decrease in plasma BNP could have contributed to this trend for AngII to increase on the basis of renin and AngII inhibiting properties of the NP (21). With the administration of exogenous BNP, there was an increase in GFR in the PDE VI group that was not observed in the untreated CHF group. Furthermore, UNaV was increased and PFRNa decreased significantly with subcutaneous BNP in the PDE VI–treated group, whereas the change was NS in the untreated CHF group. This improvement in the renal response to exogenous BNP in the PDE VI–treated group was associated with greater urinary cGMP excretion and suppression of AngII and renin. It is well established that the renal-enhancing action of the NP is attenuated in overt CHF and is due in part to increased cGMP that is degradation by renal cGMP PDE (2). This also is true in renal disease, as Valentin et al. (13) reported in nephrotic syndrome that PDE V contributes to renal impairment and reduced sensitivity to atrial natriuretic peptide. Studies by Haneda et al. (5) and Kim et al. (3) reported that AngII and other calcium-stimulating peptides play an important role to upregulate cGMP PDE activity in both vascular smooth muscle cells and glomeruli. Our study confirms and extends previous reports and demonstrates that PDE VI potentiates the renal hemodynamic and tubular actions of exogenous BNP that were not observed in the untreated CHF group. Thus, PDE V in the kidney contributes to the maladaption of the kidneys in the syndrome of CHF with avid sodium and water retention. However, inhibition of PDE V alone does not result in improvement of renal function and may require supplemental NP therapy to realize the full renal benefits. Importantly, the exogenous BNP challenge in our study supports this conclusion while serving to test the specific pathways through which chronic PDE VI may have favorable actions, especially in the kidneys. Clearly, it seems that in the kidneys, it involves the NP system; however, the renal response was only to exogenous BNP and not to endogenous BNP. One may conclude that chronic PDE VI not alone but rather in combination with exogenous administration of BNP is an important renal-enhancing strategy that warrants further studies. Furthermore, the recent report of orally available BNP in experimental studies underscores that a strategy of combining oral PDE VI and oral BNP could emerge as a new paradigm for the treatment of cardiorenal diseases such as CHF (22). A limitation of our study is that only one dose of sildenafil and BNP was used. However, that both plasma and urinary cGMP excretion increased with the sildenafil and also with the BNP administration supports that the dosages used for sildenafil and BNP were biologically active. In this model of experimental overt CHF, chronic administration of the PDE V inhibitor Sildenafil increased both plasma and urinary cGMP but did not enhance renal function despite enhancing cardiovascular hemodynamics. Importantly, chronic PDE VI improved GFR and the natriuretic response to exogenous BNP. This study supports the therapeutic potential of a strategy to maximize the renal cGMP system by combined PDE VI and NP in CHF to improve renal function, warranting further investigations. This research was supported by grants HL 36634, PO1 71043, and HL 07111 from the National Institutes of Health and Mayo Foundation. We gratefully acknowledge the assistance of Denise M. Heublein, Sharon S. Sandberg, and Gail Harty. Heart Failure: A State of Brain Natriuretic Peptide Deficiency or Resistance or Both!